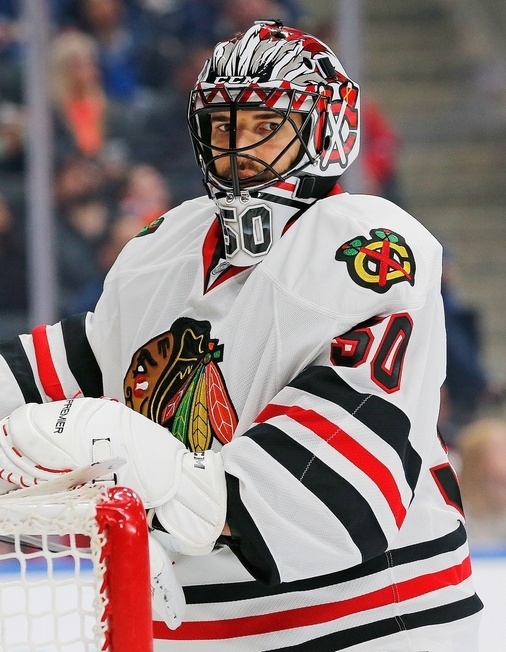 Chicago Blackhawks goalie Corey Crawford will be out two to three weeks after an appendectomy on Saturday. The team learned of the illness Saturday morning. Head coach Joel Quenneville wasn’t aware of the exact details and couldn’t say if Crawford’s appendix had burst, but the injury will put the spotlight on backup netminder Scott Darling for a period of seven to 10 games. Darling took the start against the Flyers on Saturday, as Crawford developed appendicitis mere hours before the contest and was taken to an area hospital for treatment. The 27-year-old backup allowed three goals in a loss to Philadelphia. Crawford, meanwhile, had been off to a good start in the 2016-2017 season. He’s 12-6-2 in 20 games, with a 2.27 goals against average and a .927 save percentage. He’s posted two shutouts thus far. Darling is 4-1-1 across eight games, with a 2.81 goals against average and a .907 save percentage. Quenneville says that Darling has the full faith of the franchise right now and will receive the start against the Winnipeg Jets on Sunday. 23-year-old Eric Semborski was signed to an amateur tryout contract. The Blackhawks are up against the salary cap, so the former Temple University player was tagged in the backup spot for Saturday’s action. Semborski wasn’t paid for his efforts and got the call less than two hours before puck drop. The Blackhawks are currently 16-7-3 on the season, good for first in the Central Division.